I appeal to you therefore, brothers and sisters, by the mercies of God, to present your bodies as a living sacrifice, holy and acceptable to God, which is your spiritual worship. Do not be conformed to this world, but be transformed by the renewing of your minds, so that you may discern what is the will of God—what is good and acceptable and perfect. For by the grace given to me I say to everyone among you not to think of yourself more highly than you ought to think, but to think with sober judgment, each according to the measure of faith that God has assigned. For as in one body we have many members, and not all the members have the same function, so we, who are many, are one body in Christ, and individually we are members one of another. We have gifts that differ according to the grace given to us: prophecy, in proportion to faith; ministry, in ministering; the teacher, in teaching; the exhorter, in exhortation; the giver, in generosity; the leader, in diligence; the compassionate, in cheerfulness. My sermon from the 12th Sunday after Pentecost (August 27, 2017) on Romans 12:1-8. Listen to the recording at the bottom of the page or read my manuscript below. I can’t imagine 46” of rain in just a few days. When it rains an inch here in New Jersey, my backyard starts to look like a pool. So if we had 46”, I’m sure my house would just float away. It’s hard to imagine that much rain falling from the sky but that was the forecast I saw yesterday morning as Hurricane Harvey stalled over the southeastern coast of Texas. When the Hurricane made landfall on Friday night, I watched online as a hurricane-chaser was broadcasting the storm coming ashore. I couldn’t actually see anything. It was too dark and too stormy. I could only see these white pixelated blobs, being blown around violently. The stormchaser narrated what he was experiencing which, as the hurricane eye came ashore, was only fear and terror. Even though they were surrounded by thick concrete blocks while taking shelter in the stall of an automated car wash, their car shook back and forth. Once the storm passed, these broadcasters posted pictures of the damage. Houses were blown apart, lakes now exist in what used to be farmer fields, and boats are inland, far from shore. Harvey has weakened into a tropical storm but its threat has skyrocketed. Cities and towns, including Houston, are flooding. They will receive as much rain in a few days as they get in a year. This morning, I saw reports that Houston received 20” of rain overnight and in only 3 hours, broke all their projected once-in-500 years rainfall amounts. People are in danger because not everyone evacuated. Some stayed because that’s what they were going to do. But others were stuck because of health issues, age, or immigration status. The storm is still there. The rain is still falling and falling and falling. It’s hard to even imagine what will happen next. Now, those of us who lived in this area when Sandy hit, know what storms can do. It’s been years but youth groups from Lutheran churches across the country still come to New Jersey to rebuild and repair homes. These once-in-a-lifetime kind of storms now seem to happen every few years. And the damage they cause can’t be fixed overnight. Once the homes are repaired, the rebuilding of people’s lives begins. And many will never have the kind of life they used to because these kinds of moments, these kinds of storms, change everything. 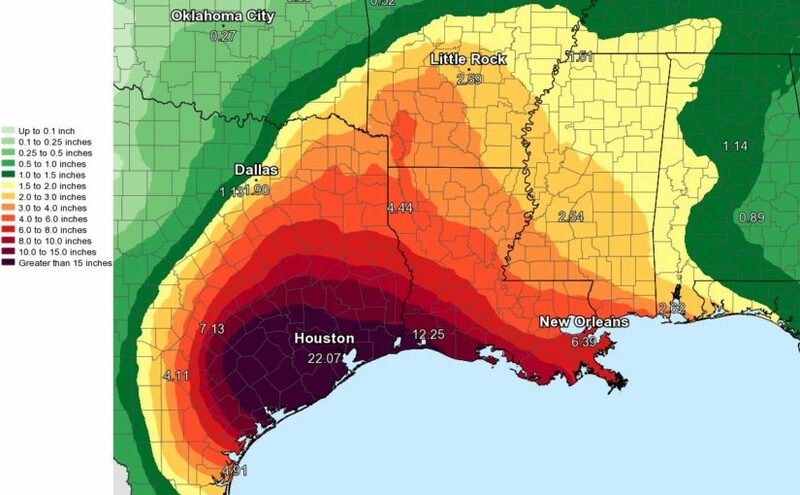 Storms like Harvey, where forecasters don’t even have enough colors in their map legends to show just how much rain will actually fall, disrupt lives, change the physical landscape, and leave lasting wounds on the physical, emotional, and spiritual well-being of everyone who lives through it. The damage from storms like Harvey lingers. Time can’t make this new reality fade away. Instead, the world and our lives become different when we experience a storm like Harvey, or Sandy, or experience a personal hardship that we know we will never get over. Instead, we keep on living because that’s all we can do. But what does living look like? Paul, in our reading from Romans today, calls us to be a living sacrifice which is a weird phrase to begin with. We mostly think of sacrifices as something we give up or it’s some kind of mental exercise that stays in our head and remains abstract. But in Paul’s day, sacrifices were an everyday reality. Rome was a city full of temples dedicated to various gods who needed real sacrifices. Cows, goats, birds, vegetables, and all sorts of living, breathing, things were regularly killed, burnt up, and sprinkled on altars everywhere. Sacrifices were not abstract to Paul, because he could walk out his front door and see an animal being offered to a god. A sacrifice in Paul’s day meant that a very real thing had to die. This kind of sacrifice asked a god to do something for you or for the nation. Some gods demanded a regular sacrifice as a way of maintaining this human and divine relationship while other sacrifices were one time deals, like buying a lotto ticket and hoping for the best. Sacrifices were also something even God accepted and encouraged at the temple in Jerusalem. People in Paul’s day knew what sacrifices were and what they meant. Something had to die so that others could live. The thing be sacrificed didn’t actually benefit from what happened because it didn’t keep on living. But it was hoped this sacrifice would make a difference for others. So Paul, writing to these Romans who understood sacrifices and who, as I shared at the start of this journey through Romans weeks ago, were trying to figure out what they needed to do to master their passions and feelings and become the best Romans they could possibly be, Paul knows that these Romans want to know what a Christian life looks like. And he tells them to live a life for others and be that living sacrifice that makes a difference for others instead of themselves. “A living sacrifice” is a ridiculous phrase that doesn’t make any sense but it’s a phrase that shows us what living with Jesus actually looks like. This is Paul taking Jesus’ “love your neighbor as yourself” and fleshing it out. Our relationship with God isn’t just about the big G and me. It’s about you and I and the person sitting next to us being for everyone else. Love, as Paul and Jesus both knew, isn’t just an emotion. Love is a life lived for others. And that kind of love is…hard. It isn’t easy. And it’s the kind of love that doesn’t always know what to do when we see our friends, neighbors, or even strangers suffering. When we watch as storms uproot and change people’s lives forever, it’s easy to be overwhelmed because we don’t always know exactly what others need. When we ourselves are undergoing our own storms, this call to live for others becomes almost impossible because we are barely keeping our own heads above water. When we can’t help, we need others to step in and when they need help, we need to take a hard step, a difficult step, a step that might cost us something very real and get involved. It’s not easy, as an individual, to be a living sacrifice but Jesus doesn’t ask us to live this Christian life alone because being a Christian isn’t something we can do alone. Storms happen. Floods come. And even if we discover how to turn back climate change, there is still going to be some natural or man-made disaster or war or personal tragedy that is going to make this life hard. We need each other and Paul knows we do because the “you” in this passage isn’t singular. It’s plural. It’s about…all of us…right now. When we were baptized, we were drafted onto Jesus’ team. We were connected with a savior who knew what humans can do, who faced the evil we do to each other, and still went straight to the cross for all of us. We are united with those followers of Jesus in all times and in all places who just lived…and loved..and made a difference even when their hope was just a flicker that only a few people could see. We get to be a living sacrifice because Jesus was, and is, a living sacrifice for us. And we are connected to a community of individuals called to live for each other, no matter what. Our Christian life needs others and is lived most fully when we are in a community because it’s by being in a community that we can get through the storm.